Antibiotic-free. It’s something of a buzzword these days, but when Chick-fil-A announced in 2014 it would eliminate all antibiotic usage from its chicken supply in just five years, it made waves. The goal: to respond to, even exceed, one of its customers’ top requests. While many other restaurants across the country had begun introducing antibiotic-free chicken on their menus, Chick-fil-A’s commitment was distinct. Rather than simply sourcing available chicken raised without human antibiotics, as is the common practice in the industry, the company was seeking the USDA’s highest antibiotic-free designation: No Antibiotics Ever – zero antibiotics, from egg until consumption, for 100 percent of its chicken supply. And as the nation’s top chicken chain, there simply wasn’t enough chicken available on the market to meet this new, rigorous standard for every Chick-fil-A restaurant. The move came in response to research conducted by Chick-fil-A, which revealed that 70% of consumers saw antibiotic use in meat as an issue that mattered to them, prompting the company to take swift action. But implementing a 100-percent antibiotic-free method of raising chicken could also have far-reaching implications. “Not only is this good for customers, but it has the potential to positively impact the larger food system as well,” says Lyon. According to Lyon, Chick-fil-A serves only breast meat, but its new antibiotic-free farming practices apply to the full bird – providing suppliers the opportunity to offer No Antibiotics Ever dark meat to other venues, from restaurants to school cafeterias. And because Chick-fil-A is the country’s largest chicken chain (by domestic sales), that impact on the larger food system could be significant. The chicken served by the restaurant is already raised free to roam in climate-controlled barns based in the United States. The effort to eliminate antibiotics is taking the health of the birds — and the demands of the customer — one step further, Lyon says. The reasons for eliminating antibiotic use in meat are many, including the emerging risk of antibiotic resistance, which can create superbugs. It also encourages a healthier living environment for the chickens, which can reduce the need for antibiotics in the first place. In the barn, for example, this can mean regulating ventilation, ammonia levels, litter condition and temperature levels. Animal husbandry performed with an eye toward eliminating antibiotics is nothing new, says David Rothmeier, who’s responsible for sourcing all of Chick-fil-A’s proteins. “But going fully No Antibiotics Ever is a paradigm shift for a fast-food restaurant,” he says. As customers resoundingly ask for more transparency around what goes into their food, the transition to chicken raised with No Antibiotics Ever is just one part of Chick-fil-A’s commitment to continuous menu improvement and serving food people can feel good about – an effort the company refers to as “better-for-you fast food.” The restaurant recently pledged to source only cage-free eggs within 10 years, as the supply becomes more readily available. It has also taken steps to remove unwanted ingredients, such as trans fats and artificial colors from its dressings and sauces, among other changes. “The underlying basis for our decision is our customers. We’re always listening to what they care about,” Rothmeier says. The vast majority of the protein Chick-fil-A serves is chicken — no surprises there – and given the sheer amount of chicken sold, this commitment has the potential to help shape the future of the poultry industry in the U.S. By the time the restaurant enters the year in 2020, a number of big chicken suppliers will have updated their facilities to comply with No Antibiotics Ever regulations. In turn, this will make it easier for other suppliers to adopt the No Antibiotics Ever program – something Lyon believes will eventually have a positive influence on public health. 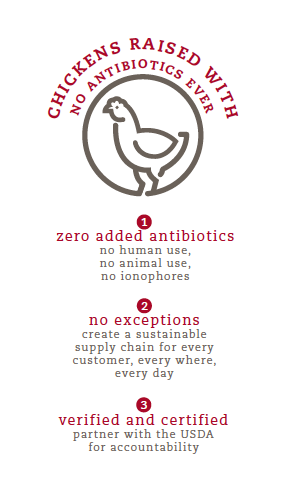 To be sure, converting an entire supply chain to raise antibiotic-free chicken is a challenge. But responding to customer demand — especially when it’s for the greater good — is also a passion for Lyon. “Ultimately, all of this hard work is really about serving customers food they feel good about,” Lyon says.